Everyone has different ideas about accommodation in Hawaii. Some would like to experience a greater adventure in a tent, others prefer to live in a room with locals, and some prefer to be pampered in one of the many hotels in Waikiki. No matter where you decide, you still have to plan your holiday in Hawaii. 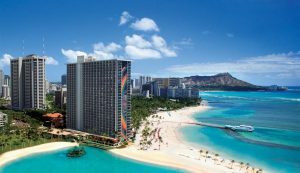 Therefore, we’ll show you a few options to choose from and how much budget you’ll need to budget for your accommodation in your Hawaii vacation. Directly in Waikiki you won’t find any places to camp, of course, but in many less visited places on the island of Oahu. 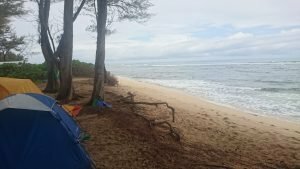 For example the Malaekahana Beach Campground is located in the north of Oahu and is one of the safest campgrounds. Per person you pay $9,41/night (without tax). Ywca Camp, located in eastern Oahu, offers small cabins that cost $21 per night per person. Camping on this campground costs $42 per tent per night. The minimum stay is 4 nights. Hawaii of course offers a variety of campsites, whether you are on Oahu, Maui or Kauai. Hostels are very popular with travellers who like to meet new people and don’t attach much importance to comfort. The site Hostels.com offers you a good opportunity to compare different hostels in Hawaii. The Waikiki Beachside Hostel is one of the best known and most popular hostels among tourists. A 2-week stay in a mixed dormitory with 8 beds costs about $570. Above all that it’s probably one of the best and cheapest options for backpackers. Holiday apartment or AirBnB in Hawaii? There is no big difference in price between holiday apartments and AirBnB. I found my accommodation via the AirBnB portal and am very satisfied with it. You have more possibilities there. You can book a complete apartment or a room in a shared flat. I have a room in the apartment of a couple. Also, the advantage is that you get to know local people as soon as you arrive, who can give you helpful tips for hikes, beaches or restaurants. In addition to that, you can be on the move much more spontaneously and are not tied to meal times or anything else. A complete apartment in Waikiki for two weeks is about $1,300. Furthermore, a holiday apartment for the same period is $1,550. You can compare holiday flat very well on the portal Home to Go. Here it depends of course always on what preferences you have. Would you like a large apartment with lots of space and several rooms, or a room with a small kitchen and possibly a shared bathroom is enough for you? Waikiki Beach with numerous accommodations. The easiest way to find accommodation is probably in one of the many hotels in Waikiki. You can get a good overview of the prices of different hotels by visiting the websites Booking.com, Expedia.com or Kayak.com. The Moana Surfrider Hotel costs $5.090 in a standard room for a two-week holiday. But the hotel is also the best Waikiki has to offer. As you can see, there are many ways to find accommodation in Hawaii and there should be accommodation for every budget. So each type of accommodation will certainly have its advantages and disadvantages. But it is important that you have an unforgettable Hawaii vacation! I hope these tips on Hawaii vacation accommodation have helped you prepare your first Hawaii vacation! Also write to us on Facebook if you have any questions and follow our next articles that will tell you everything about planning your holiday! For sure, DanielsHawaii will also be happy to show you the island and show you the best spots on a guided tour!